My husband is an avid cyclist, and although he is now recovering off the road after a nasty bike accident, when he was riding daily for hours at a time he was trying his best to eat many small nutritional snacks throughout the day. One of his favorite snack items is a multi grain wrap. He may spread it with hummus, or stuff it with leftover veggies from last night’s dinner, though he really enjoys the wrap spread with natural chunky peanut butter and wrapped around a peeled banana as show. This is a great, quick and nutritious snack for adults or kids alike. 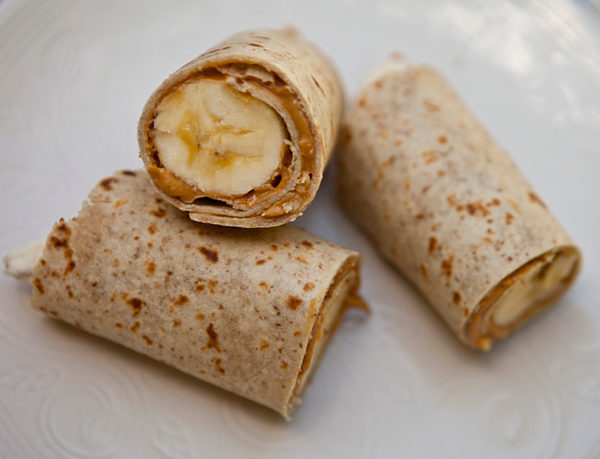 Multi grain wraps are a good source of fiber and protein. Peanut butter though high in fat contains mostly monounsaturated healthy fats. Peanut butter contains fairly high quantities of dietary fiber, which helps in regulating both blood cholesterol and blood sugar levels, and is protein rich. Peanut butter also contains very important micro-nutrients such as Vitamin E, Vitamin B3 and large amounts of beneficial minerals such as iron, magnesium, potassium, copper and calcium. An easy, nutritious snack enjoyed by both kids and adults alike. 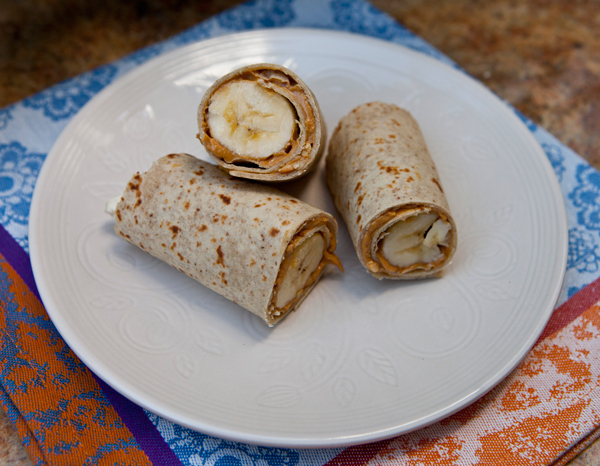 Spread the wrap with the peanut butter then roll it around the banana.